Multi-line selection and indent is not working for Multimarkdown Composer. I cannot highlight code samples or lists and adjust indentation as a selection. When I select a set of lines and press keys to indent (tab?) it removes all the text. I'm on my spare MacBook Pro, so I'm not sure if that makes a difference. My normal has it's keyboard being repaired (finally), since it keeps giving me duplicate bbb's. 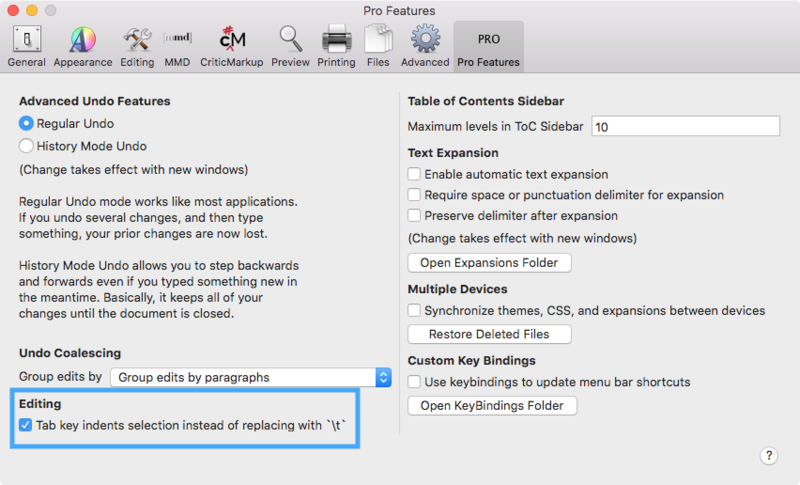 I know you made keyboard binding changes, but I'm confused if I need to do anything, if I hadn't done anything in the past. inserting a tab? (Pro Preferences). It works fine for me when that setting is turned on. 1. Yes, the Pro tab checkbox fixes it. Thanks! 2. Does the "Command" + "]" not work? I thought I saw that in the key bindings file, but I'm a little confused about how that works. Shift Left and Shift Right are the menu commands to indent and outdent. Cmd + ] and Cmd + [ don't work for me. I hear an error beep when I try it. Looks like it's Control + Command + Right-Arrow. 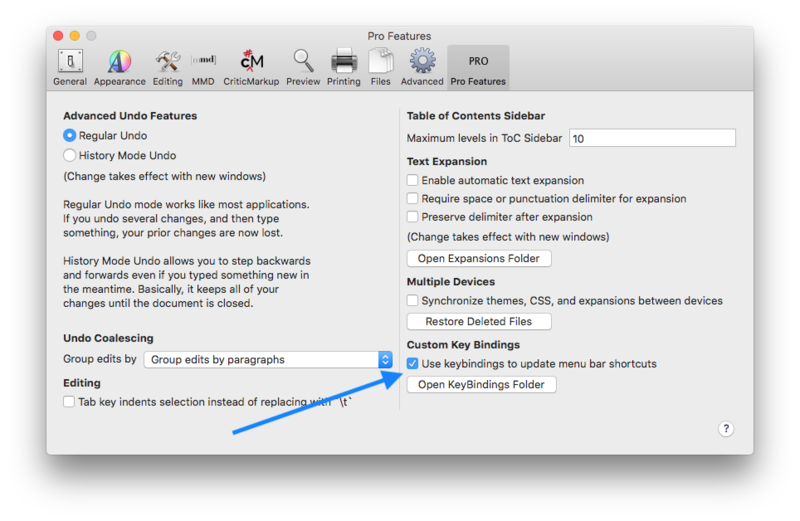 I quit the app and relaunched it after clicking on the Checkbox "Use keybindings to update menu bar shortcuts" and now the new "Command + ]" shortcut works. Can you refresh that without quitting the app? Otherwise tell the user to get it to trigger. Sorry for the delay -- I updated the preferences for the new version to make this clearer. Fletcher closed this discussion on 03 Sep, 2018 07:42 PM.